Elegance and premium all-round performance – the GROHE Allure five-hole bath combination with hand shower! Inviting minimalist style meets versatility and cutting edge technology! With a sleek look based on the rectangle and circle, the deck-mounted five-hole GROHE Allure bath combination creates a dramatic style statement in any modern bathroom. Packed with GROHE’s innovative technology, the taps and hand shower are also a delight to use and delivers a new level of bathroom luxury. The two handles are beautifully designed and the Sena stick handshower with 2000mm hose makes washing your hair quick and convenient. GROHE DreamSpray ensures the flow of water from every nozzle is lovely and even and the handy silicone SpeedClean nozzles are easy to keep free of dirt and limescale! The scratch resistant GROHE StarLight chrome has a shine that lasts for many years and the Inner WaterGuide stops the surface of the shower from getting hot. It can be installed with the GROHE baseframe (29037000). GROHE Allure – where supreme bathroom design and comfort are fused with functional perfection. Our Normal spray is a powerful spray pattern that is perfect for a revitalizing and refreshing shower. 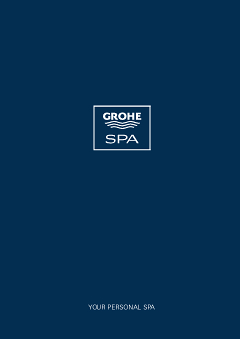 Enjoy the trusted GROHE quality every day.